PHOTO: G. Michael Graham, Fort Thomas Matters. The Highlands Bluebirds football team starts spring ball Monday. 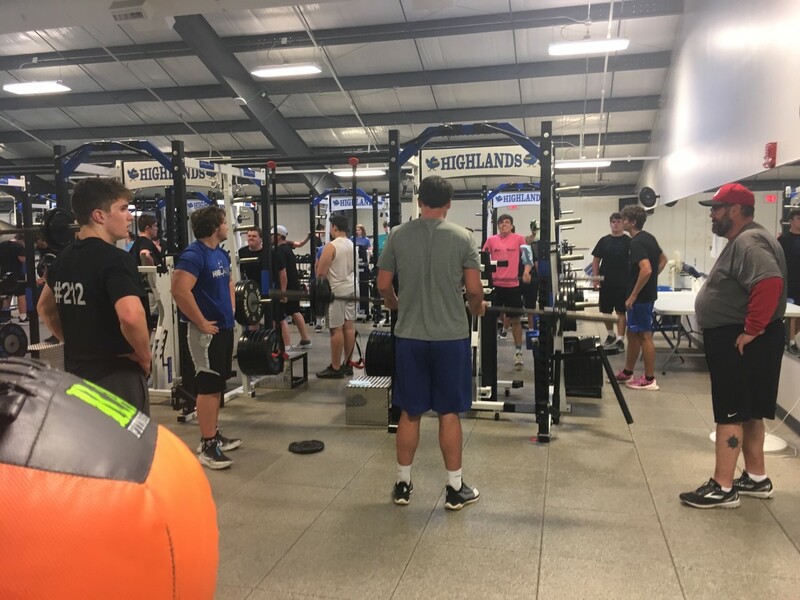 Just days before the start of spring practice, the new offensive coordinator of the Highlands Bluebirds in Sam Umberg gave supporters a huge reason to be excited for the fall. "We have to play like sharks," Umberg said. "When there's blood in the water, we have to go in for the kill. When the defense gets a turnover and we have short field position, we have to score and we have to score now. There's no waiting on anything." That sense of urgency has been a huge reason for the success of the program over the years. When Dale Mueller was head coach, Highlands consistently ran up to the line of scrimmage once the play was over and hiked the ball quickly. That often saw defenses receive offsides penalties for not substituting quickly or have a player out of position. 859-781-5777. This is an advertisement. Umberg worked with the running backs last season. He played high school football for the North Gwinnett Bulldogs located to the northeast of Atlanta (Georgia). He served as a graduate assistant at NCAA Divsion II Valdosta State for five seasons working primarily with the offense and later came to Morehead State before coming to Highlands. The Valdosta State Blazers own four national championships in school history. Umberg was on staff at VSU on the 2012 national championship team. "We're going to be the first ones getting up off the ground," Umberg said. "We're going to be the first ones lining up at the line of scrimmage ready to rock and roll. We're going to be going fast. Hopefully on the other side of the ball, they won't know what hit them." In Mueller's last season as head coach in 2013, Highlands averaged just more than 324 yards passing and 116 rushing for 440 per game. The Bluebirds averaged just under 51 points per game that season scoring 70 or more points four times that year. Highlands ran some no-huddle, up-tempo football the past five seasons, but not to the same extent as the 2013 team. Highlands Head Coach Brian Weinrich had been the defensive coordinator from 2002 to 2013. He switched to the offensive side from 2014 to 2016 before going back to the defensive side in 2017. Assistant coach Zach Deaton had been the offensive coordinator the past two seasons. Weinrich said Deaton still has a huge role on the staff. "That's been the mantra here for a while. We want to go. Especially this year, we feel like we've got a lot of guys that can do stuff and we want them to do stuff," Weinrich said. "We want to get (the ball) to them. We want to run as many plays as possible with them. It's been a great off-season to confirm that's what we have as a group. They've responded. They're working hard. We're just excited about getting out there Monday, doing some football and seeing where we are. We'll start to measure ourselves and start to get better as fast as we can." Umberg said he's aware that while 10-3 is a good season, it is not good enough at Highlands. The Bluebirds had that record last season driving back to the region championship for the first time since 2015 before losing 36-0 to eventual Class 5A state runner-up Covington Catholic. Highlands averaged 307 yards of total offense per game last year and just above 31 points per game. But junior wide receiver Adam Weyer said the receivers had difficulties breaking away from good defensive backs so the team had to try to rely on the running game maybe more than preferred and teams keyed on that. Umberg would like to see the Bluebirds average between 40 to 45 points per game. "One of the things we're going to focus on coming up is putting our players in the best positions to succeed," Umberg said. "All 22 starters we have out there are great. We have some guys that really set themselves apart. We'll put them in mismatches to where we can exploit defenses." Highlands returns a number of skill players and three starters on the offensive line. Junior Collin Hollingsworth is expected to take over at quarterback. The leading returning running back is sophomore Joe Buten who ran for 537 yards on 83 carries and nine touchdown for an average of about 6.5 yards per carry. Junior Hunter Ahlfeld is the leading returning wide receiver with 29 catches for 417 yards and six touchdowns. In order to run an up-tempo offense, the players realize the importance of conditioning. "Conditioning is huge for us. Highlands has always played a fast game," said Tyler Brune, Highlands junior running back. "It's just really important that we stay in shape and we're able to beat other teams based on the fact that we're able to go harder than them longer." Spring practice runs from April 15 through May 3. The team will practice each Monday, Tuesday and Wednesday during that time and on Tuesday, April 16. "We're about to hit that point to where we're really instilling into the guys how fast we need to go in order to accomplish what we need to accomplish," Umberg said. "The way I see it, spring is the perfect time to teach that and instill that in their heads. We'll continue that moving into summer as well." Highlands opens the season at Scott on Aug. 23. Game time is 7 p.m.